Crafting the home of your dreams is a wonderful ambition and you will have to make many important decisions along the way. Flooring is a matter of particular importance since it can seriously impact your daily activities. Many homeowners in Rochester, NY debate whether to have carpet installation or use area rugs instead. While each can enhance the visual appeal of a room, flooring is much more than something to look at. We can help you make sense of this important decision. Simply put, carpet is designed to last in a way that area rugs are not. Chances are, that expensive rug will last only a few years before starting to show signs of age; carpet can stay looking fresh and new for much longer. Once a rug starts to fray and tear, there is little hope for it. 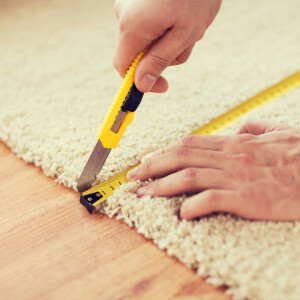 Carpet can be repaired by professionals, so there is no need to reinvest in a floor covering every time a hole or tear occurs. As nice as they might look, area rugs have a tendency to become tripping hazards. Rug tape and other solutions exist, but they are not a sure-fire way to avoid tripping. This is a particular concern for families with young children and older adults. A carpet installation eliminates this hazard. To maintain their look – and to preserve your family’s safety – rugs should be secured to the floor with rug tape. This can be hard to find and surprisingly expensive; without it, rugs have a tendency to ripple, disrupting the appearance of a room and presenting a serious tripping hazard. Once installed, the only care that carpet requires is occasional vacuuming. Rugs often reflect the very latest in taste – which is great until that trend’s heyday passes. Carpet is designed with an eye for longevity; you can install carpet with more confidence in it being in perfect taste for a much longer period of time. Why Choose Greenfield Flooring for Carpet Installation? Greenfield Flooring has helped Rochester area homeowners craft the lifestyle they have always dreamed of. We have years of experience and we work hard to find a solution that suits your needs and budget. We offer a wide variety of flooring materials that are perfect for all rooms in your home; in addition to carpet installation, we also handle tile, wood, and vinyl flooring products. Contact us today to discuss your flooring needs. How did you hear about us? * How did you hear about us? Google	Social Media	Referral	Other	 How did you hear about us? ©2019 Greenfield Flooring. All Rights Reserved.